So I dedicate my entry piece to one of the most trend setting ladies of the 18th Century Marie Antoinette, Dauphine of France. Picking my colour palette was inspired by the beautiful fabrics with their vibrant pastels, florals and abundance of gold. My entry piece is a hand-carved ornate sideboard that I bought from a second hand store over six months ago, I don't know the age or history of this piece but I do know it needed lots of love and attention. 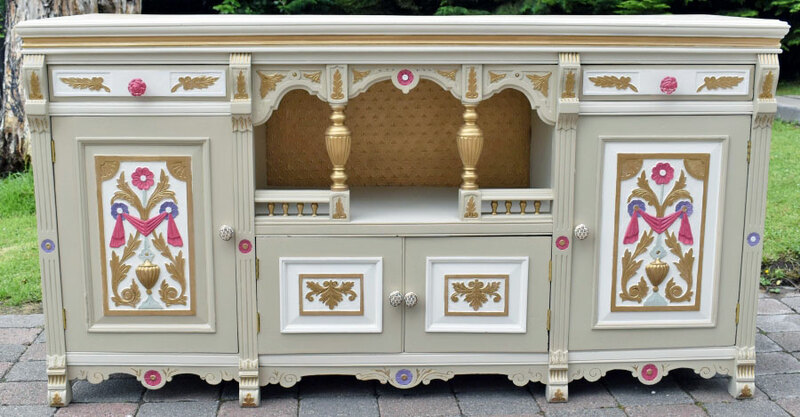 It boasts exquisite hand carved solid wood appliqués, inlays of leaves, flowers and columns. Inside the sideboard is shelved with a removable drawer for endless storage options made from hardwood mahogany. As I said earlier it needed a lot of attention. I began by removing all the hardware and the back as it was damaged, with numerous washes and sanding it was ready for it's makeover. For the main body of my piece I used General Finishes colours to create a soft colour palette, starting with Antique White. I was not happy, the dresser seem lifeless, it was to big to take one block colour, then one evening I was working late and mistakenly opened the wrong tin of paint, Linen. Before my eyes the dresser suddenly came to life, the deeper colour was so much better adding depth and grandeur I didn't expect. I decided to leave the inside Antique White also the outside panels and the top to even out the right balance of colour. Strange how a small mistake can change your direction. Then I wanted gold and lots of it. I replaced the back wood of the dresser covering it with a Fluer De Lis wallpaper to create a design effect to the back, here my journey begins with Burnished Pearl Effects, mixed with Extender I applied using a small damp sponge to the paper, I applied three coats to give an overall dept of colour. Moving on I used a small paint brush to apply Burnished Pearl Effects to all of the appliqués and recesses on the outside applying two coats. Moving on to the drawers and doors I used two coats of General Finishes Snow White on the inside panels as a base before applying three coats of the Burnished Pearl Effects to all the appliqués details using a small paint brush. I then finished of with Linen to the outside rims of each of the drawers and doors. A pop of colour, as gold was so prevalent I needed colours to enhance the overall look. I decided to go with cerise and lilacs, but they had to be vibrant in order to stand out so I got mixing, with the General Finishes colours the world is your oyster. For the cerise I mixed General Finishes Holiday Red, Klein Blue and Snow White then added a dash of Champagne Pearl Effects. For the lilacs I mixed General Finishes Royal Purple, Holiday Red and Snow White, I then added a dash of Champagne Pearl Effect. The cerise and lilacs were applied to all the flowers, I also used the cerise on the drapes on the doors to have a more uniform effect. I mixed Basil Green, Klein Blue, Seagull Grey, Antique White and a dash of Champagne Pearl Effect to achieve a very light hue of green to compliment the richness of the flowers. I renewed all of the hardware on the sideboard and replaced the drawers and doors with vintage style handles, I wanted to mix the styles of the handles so I found six antique doorknobs of different styles and materials, some gold plated and some glass. I then painted the glass rose shaped handles with the cerise coloured mix to complement the uniqueness of the sideboard. The overall look was ok but the inside needed something to cheer it up a bit, so I decided to decoupage the removable drawer. I found beautiful wrapping paper form the Royal Horticulture Society that was a perfect match for my colour scheme. My last task was the top of the sideboard. I used the Burnished Pearl Effects to create a solid line in the recess to break up the colour as Linen on its own smothered the overall look, thus making a boundary between it and the colour below. I wanted the very top of the sideboard to be much softer and delicate compared to all the colour underneath. I started with one coat of Winter White, then I mixed one part High Performance to one part Burnished Pearl Effect and using a small dry cloth, I lightly dabbed this piece to create a cloud effect over the entire surface. Finally I finished my piece with two coats of high performance top coat to protect the overall finish. I would like to thank General Finishes for this opportunity, also Tara for all her great tips and advice, good luck to everyone taking part - it has been inspiring.